The Pentagon is yet to officially acknowledge the downing of a surveillance drone over ISIS-free territory controlled by the Syrian govt, but scarce details of the incident hint at US involvement going beyond its self-mandated anti-ISIS plan in Syria. Anonymously, US military sources have confirmed that the country has lost contact with one of its drones over Syria, after SANA news agency reported Syrian government forces shot down a hostile drone in Latakia province. Sources however did not reveal the cause of the incident. “I can confirm, as I’m sure you may have from the Pentagon, and certainly they’d be the lead on this, that yesterday U.S. military controllers lost contact with an unarmed remotely-piloted aircraft operating over northwest Syria. The Department of Defense is looking into the incident, will provide more details when available,” Jen Psaki said. “We, of course, reiterate our warning to the Assad regime not to interfere with US aerial assets over Syria,” she added. “The plane was American-made, was brought down coming from the sea, and the Syrian air defense was the one that brought it down,” the Syrian military source told Reuters. Meanwhile another source told AFP that the drone was not immediately identified as being American, but was shot down as any hostile aircraft would be. The fact that no Islamic State fighters are present in Latakia was also confirmed by the UK-based Syrian Observatory for Human Rights. They say the drone was shot down in Al-Maqata, a village near the provincial capital of Latakia. “There are no opposition fighters or jihadist groups anywhere in that area, but there is a large presence of regime forces,” said Observatory head Rami Abdel Rahman. In fact, the province is known to be the stronghold of a stronghold of the Alawite minority in Syria and the Assad family. Based on that, some Arabic sources speculated that the Predator was carrying out recon for a possible assassination mission, and was flying from Jordan, whose bases are being used by US allies against ISIS. 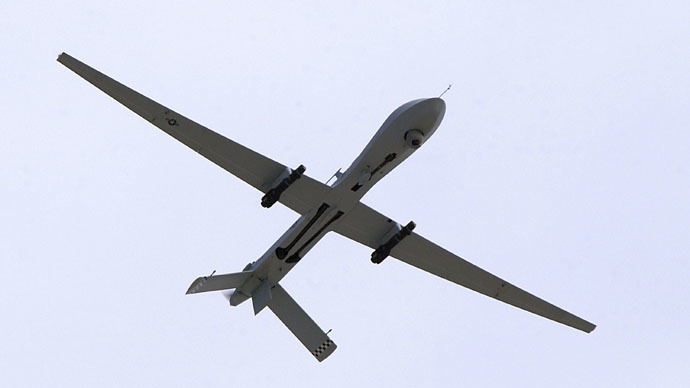 The MQ-1 Predator is an unmanned aerial vehicle, which the US army claims has gone missing, is used by the United States Air Force and Central Intelligence Agency. While the Predator carries cameras and other sensor equipment for surveillance mission, it’s armed modifications can carry and fire AGM-114 Hellfire missiles, as demonstrated during numerous combat missions in Afghanistan. Syria did not formally consent to the strikes on its territory, claiming that operations without Damascus’s coordination is a violation of sovereignty. “Any action of any kind without the consent of the Syrian government would be an attack on Syria,” said at the time the national reconciliation minister, Ali Haidar. “I think it is totally appropriate that the Syrian governments shows its sovereignty over its airspace,” Antony Hall, a professor at Lethbridge University told PressTV. However the US authorities, who have long been demanding Assad’s unconditional resignation, insist that his power is illegitimate, thus claiming there was no need for military coordination with Damascus.